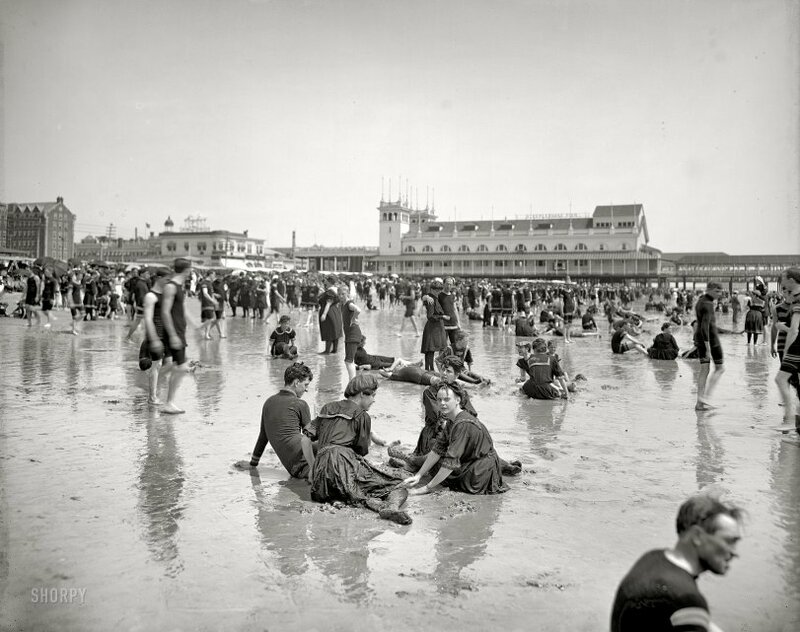 The Jersey Shore circa 1905. "Atlantic City, on the beach." Surf, sand and Steeplechase Pier in the distance. Detroit Publishing Co. View full size. Chatham County, Georgia, circa 1937. "Stoddard's Lower Range from Factory [Factors] Walk, River Street, Savannah." 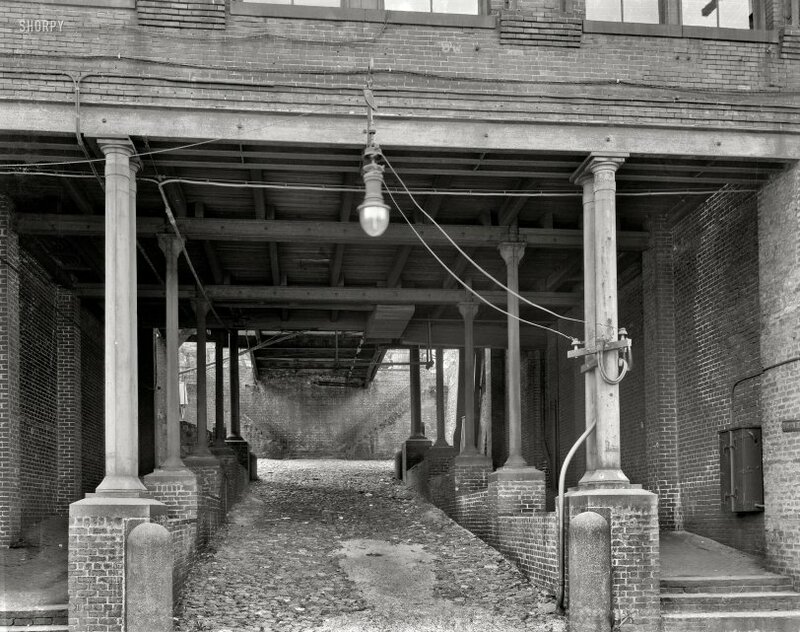 Passage through the cotton warehouses built by John Stoddard on the bluffs above the Savannah River in the late 1850s. 8x10 inch safety negative by Frances Benjamin Johnston. View full size. New York circa 1914. 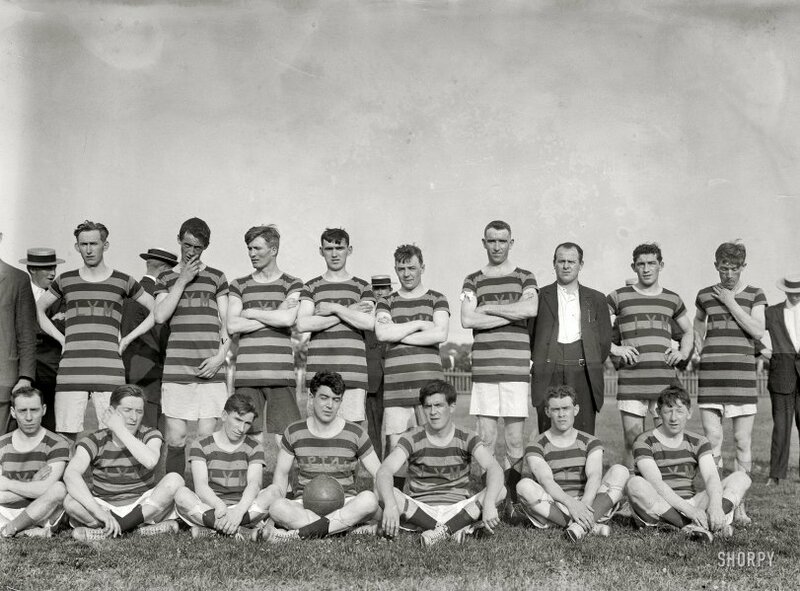 "Leitrim football (soccer) team." Or perhaps more accurately, Gaelic football. On this day it was the Leitrim Young Men's Society against Cavan. 5x7 glass negative, Bain News Service. View full size. Our family poses for our first ever color photo in July 1951. We're joined by my godmother's son Alfred at the far left; his father is taking the picture and it's their green 1941 Cadillac on whose bumper I'm perched. Another thing that's not ours is the house; our own just-purchased summer place here in East Guernewood, California is out of range to the right next door. The only bad thing about this photo is that it was shot on Kodacolor; by now the negative, if it even exists, would be totally opaque. All we have is this 3½ x 5-inch print and, like all Kodacolor prints of that period, it's faded and acquired a predominant yellow cast. Over the years I've tinkered with it several times, and this is my latest restoration effort. * For reference, my father is 49 here, my brother almost 14, my mother about to turn 43, my sister 17, and I'm a month away from 5. I didn't have to say "cheese" for the camera; summers at our place at the Russian River were just about the happiest days of my life. *Additional tweaking by Dave. View full size. New Orleans, Louisiana, circa 1937. 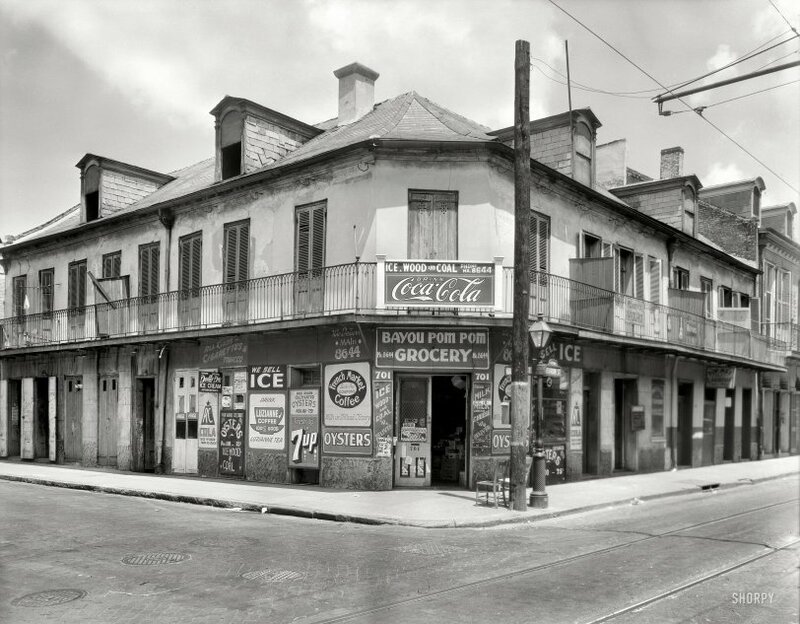 "Bayou Pom Pom Grocery, 701 Bourbon Street at St. Peters Street." Ice, wood, coal, Coke and oysters -- let me in! 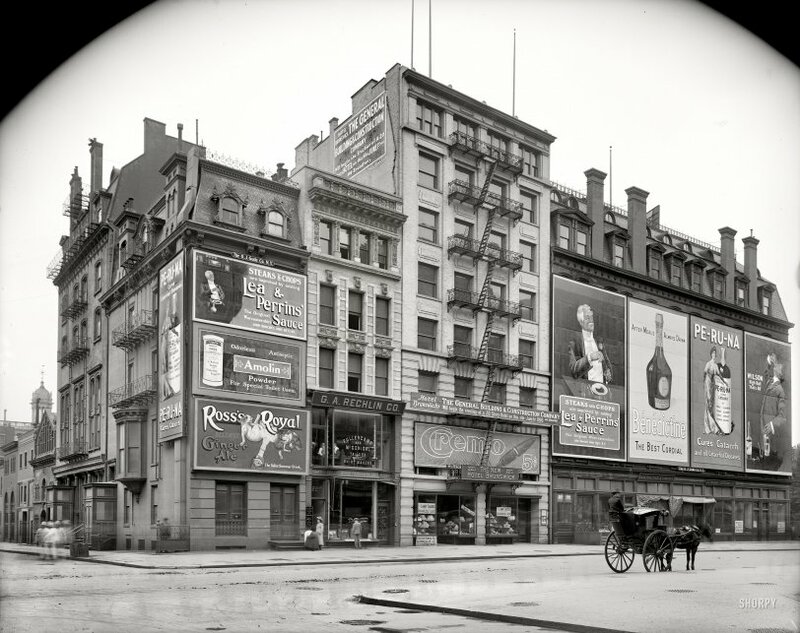 8x10 inch acetate negative by Frances Benjamin Johnston. View full size. 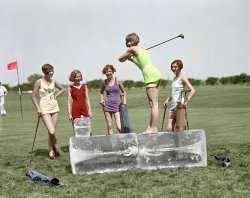 Washington, D.C., circa 1922. "Benj. 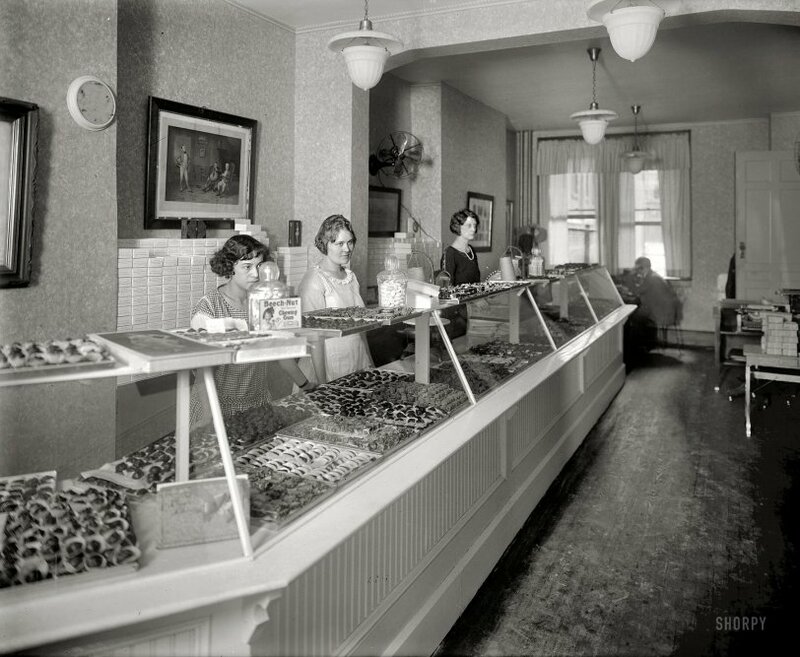 Franklin candy store, 13th Street N.W., interior." National Photo Company Collection glass negative. View full size. 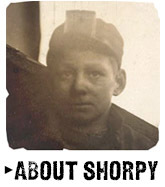 January 1925. Fairfax County, Virginia. 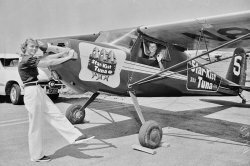 "Makely Motor Co., Falls Church." 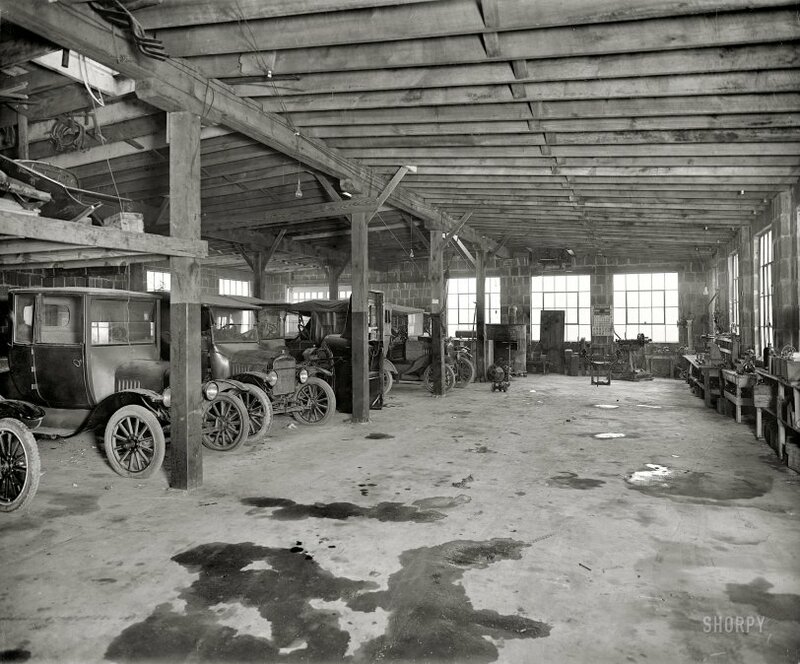 Our second look at this establishment shows a number of Model T Fords in the service garage. National Photo Company Collection glass negative. View full size. New York circa 1903. 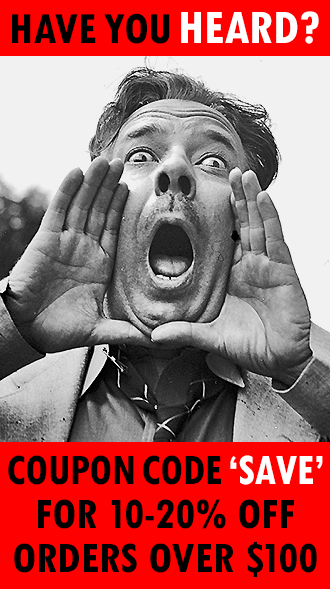 "Detroit Photographic Company, 229 Fifth Avenue." On this block destined for demolition, Everything Must Go. And Everywhere a Sign. And, for connoisseurs of ghost pedestrians, two sets of spectral footfalls. Plus a Dept. 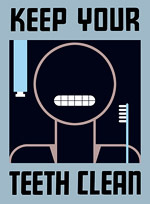 of Sanitation sweeper! Detroit Publishing glass negative. View full size.